Thank you for your interest in THE QUARTETTE ACCORD string ensembles. 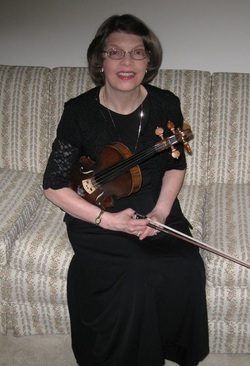 I'm Sheri Berger, the group's principal violinist, founder, and manager. I was born and raised right here in St. Louis. With both parents holding Master's degrees in music, my classical training started at a very young age. Private study with a St. Louis Symphony member began during elementary years, and continued through college (full tuition music scholarship) and even post-collegiate years (for a total of three St. Louis Symphony members as well as the concertmaster of the Indianapolis Symphony). THE QUARTETTE ACCORD was established in 1991, and was initially set up in response to individual requests for string quartet music at wedding ceremonies. Gradually, services were expanded to include duo (ACCORD DUO) and trio (ACCORD TRIO) options, and to provide entertainment for receptions, parties, holidays, birthdays, grand openings, and just about any other celebration imaginable. Today, though most grounded in the likes of Bach and Mozart, THE QUARTETTE ACCORD ensembles find equal enjoyment in playing the best of the Beatles, favorite movie or show tunes, oldies but goodies, jazz and ragtime, pop/rock headliners, and more. Members of THE QUARTETTE ACCORD have all spent long hours mastering their craft. Many of the players hold graduate music degrees and teach music privately and/or in public schools. With well over 20 years of experience, and as members of the St. Louis Musicians' Union, we have also been involved in a wide range of other musical performances throughout the St. Louis metropolitan area, thereby improving the playing quality that THE QUARTETTE ACCORD string ensembles can offer you.